Located roughly 16 miles southeast of Ottawa National Wildlife Refuge, the Price-Adams Unit is a public hunting area near the Little Portage River. Outside of hunting season, folks are welcome to make use of this area for hiking, wildlife observation, and photography. The 170 acre parcel features habitats varying from woods to prairie to pools, and could host an abundance of wildlife and bird species. There is a gravel parking lot here, but no defined trails. This site is open during daylight hours only. Travel east (left) on SR 2, then turn south (right) on SR 19. Just outside of Oak Harbor, turn east (left) on CR 17. Turn south (right) onto S. Muddy Creek North Rd. Turn east (left) on W. Little Portage East Rd. The Price-Adams Unit will be approximately a mile down the road on your right. This section of Ottawa National Wildlife Refuge is located southeast of the main complex, about a quarter mile south of State Route 2 on Benton Carroll Road. The Boss Unit is comprised of a variety of habitats and features a parking lot and accessible observation deck for viewing wildlife. 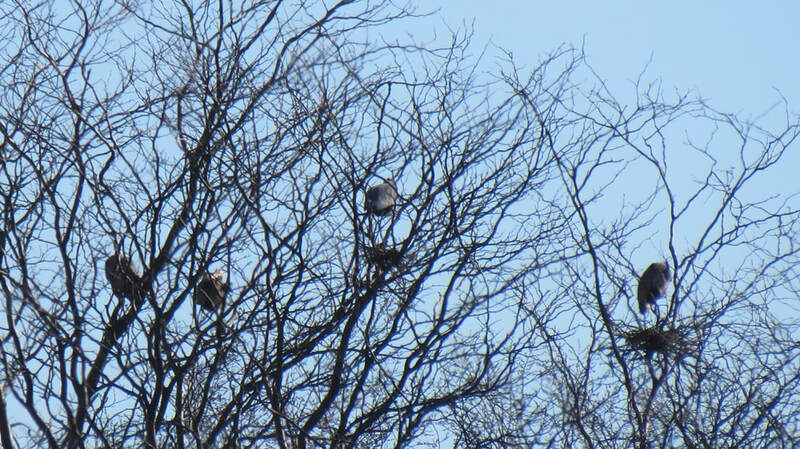 It can be a good spot for migrating waterfowl and shorebirds depending on rainfall during the spring and fall. It also features a kestrel box and a bald eagle nest. Put this one on your list of spots to visit! Travel east (left) on SR 2, then turn south (right) on Benton-Carroll Rd. The Boss Unit is approximately a quarter of a mile down the road on your right. Only accessible with a tour group. Call 419-898-0014 for availability. This unit is located on North Toussaint Road, just east of Benton Carroll Road and approximately 4 miles southeast of the main refuge complex. This site is home to a tree restoration project... you'll know that you are here when you see all of the plastic tubes sticking up out of the earth! These are guards to protect the young trees from grazers like rabbits and deer. In addition to the tree restoration and prairie habitat, the property is also right next to the Toussaint Creek promising a variety of bird and wildlife species. This spot could get really birdy during spring migration with potential for sparrow species, dickcissels, wood warblers, and herons. The Helle Unit now has a parking lot and kayak launch for visitors to use. During the hunting season, this is also a public hunting area. Friends of Ottawa National Wildlife Refuge raised funds for this site during the #givingtuesday appeal in 2017, and work is nearly complete thanks to the refuge's great maintenance team! ​This will also be a great place to bird by boat or to just set up a chair and listen. Travel east (left) on SR 2, then turn south (right) on Benton-Carroll Rd. Turn east (left) on North Toussaint Rd. The Helle Unit will be on your left and right, approximately 3/4 mile down the road. The Turtle Creek Unit is located about 4 miles southeast of the main complex on Duff-Washa Rd. The Turtle Creek Unit was purchased by Ducks Unlimited in 2016 and is now part of Ottawa National Wildlife Refuge. In 2017, Friends of Ottawa raised funds to install a parking lot and canoe/kayak launch here. Donors Ruth Ann and Daniel Fraser were happy to fund the project in full in memory of Harvey Fraser. Travel east (left) on SR 2, then turn south (right) on Benton-Carroll Rd. Turn east (left) on Duff Washa Rd. The Turtle Creek Unit is approximately a mile down the road on your left. West Harbor Landing is a 16 acre wetland parcel located on SR 53 east of Port Clinton. 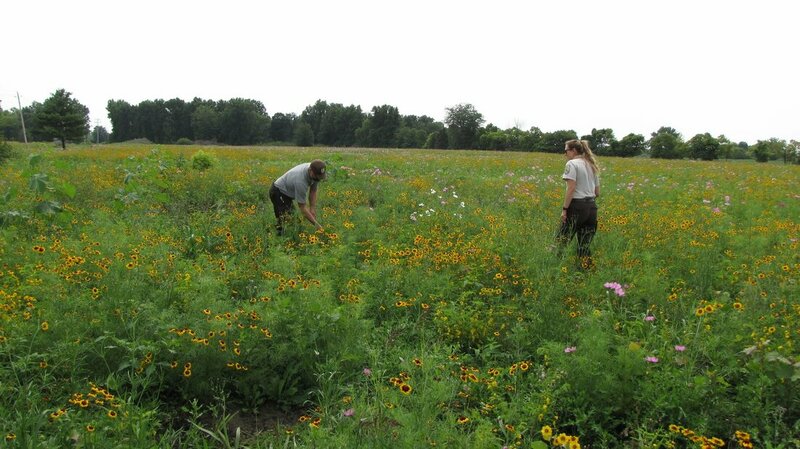 The site now features a parking lot and pollinator restoration habitat. Future plans are outlined in the button below. West Harbor Landing is a good spot to use binoculars to look at ducks, eagles, and gulls! Friends of Ottawa National Wildlife Refuge raised $12,000 towards West Harbor Landing in 2018. If you are interested in helping to further improve the site, please donate today. Travel east (left) on SR 2. Take the 53 North Exit. West Harbor Landing is located a half mile north of the 163 intersection. Stange Prairie is located on Stange Road, north of SR 2 and about two miles west of the main entrance road. The habitat here is great for northern harriers and short eared owls in the winter. 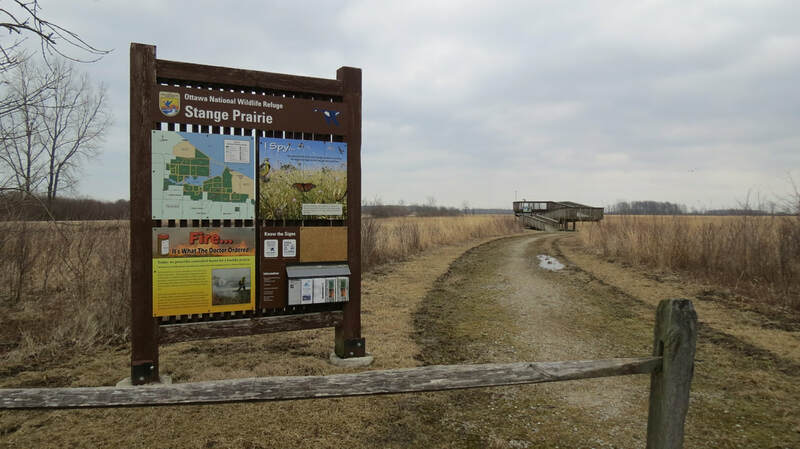 The observation deck provides an overlook into the southern edge of the wildlife refuge, and provides a good viewing spot for migrating waterfowl in the refuge pools. Once spring arrives, you can expect to see eastern meadowlarks, dickcissels, bluebirds, tree swallows, and sparrows in the grassland. Travel west (right) on SR 2. Turn north (right) onto Stange Rd. Stange Prairie will be on your right approximately half a mile down. The Knorn Unit is located on SR 163 between Oak Harbor and Port Clinton. It is the old Marinewood Golf Course. Since being acquired by the U.S. Fish and Wildlife Service in 2016, it is now the site of a pollinator restoration and tree restoration project. As the Refuge Private Lands Biologist said, "Can you think of any better place for a butterfly?"